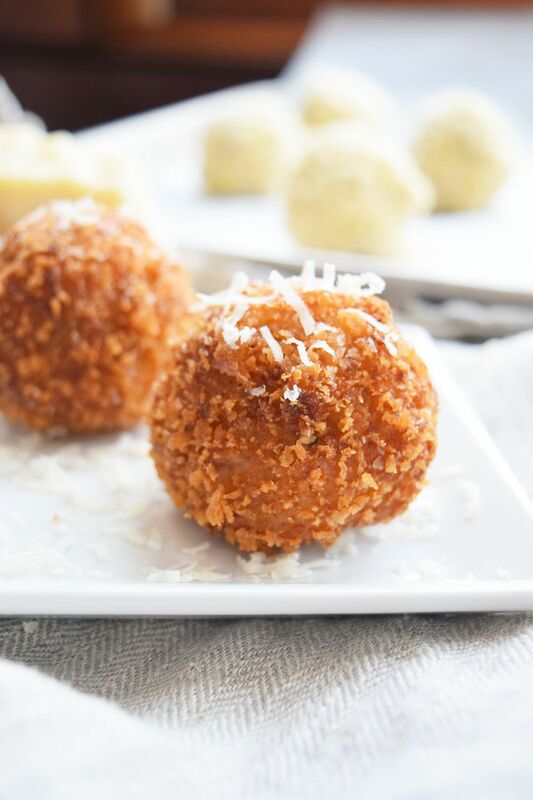 Fontina and Mozzarella Arancini are delicious fried rice balls stuffed with three gooey cheeses. They will disappear faster than you can place them on the table! They are a different and unique Italian appetizer that are sure to impress! They are a great make ahead recipe. They can easily be frozen or refrigerated after they are assembled. All you have to do is fry them right before you are ready to serve them! They will also stay hot and crispy in a warm oven while you are waiting to serve them. Place rice, stock, and olive oil in a large pot and bring to a boil. Reduce heat to low and cover, cooking for 20 minutes. Remove from heat and add the butter and parmesan cheese. Stir and add more broth if it is too dry. Cover and let sit off of the heat for 10 minutes. Allow the rice to cool to room temperature before beginning to make the arancini. You can make the risotto ahead of time and store in the refrigerator until you are ready to assemble. Take a golf ball sized scoop of risotto rice, make a well in the center and place the cheese inside. Wrap the rice around the piece of cheese and place on a parchment lined baking tray. Repeat with remaining rice and cheese. Freeze the balls on the baking tray for 2-3 hours or overnight. Place the flour in a low dish, add 1/2 tsp of salt and pepper. Place eggs in another low dish with the milk. Whisk together and add a 1/2 tsp of salt and pepper. Place the breadcrumbs in another low dish and add 1/2 tsp of salt and pepper. Dip the rice ball into the flour mixture and coat. Then dip into the egg mixture and coat. Then dip it into the Panko bread crumbs and roll to coat completely. Repeat with the remaining rice balls. Heat the oil in a heavy bottomed, deep pot on high until it is about 375 F. Turn it down to medium heat and add in a few rice balls at a time to cook. Rotate them in the oil as they are cooking to ensure browning on all sides. Remove the rice balls from the oil when they are golden brown. Place the rice balls on another parchment lined baking dish and keep in a 250 F oven while cooking the remaining arancini.